This chapter deals with the issues associated with the autonomy of vehicle fleets, as well as some of the dimensions provided by an Artificial Intelligence (AI) solution. This presentation is developed using the example of a suppression of enemy air defense mission carried out by a group of Unmanned Combat Air Vehicles (UCAV). The environment of the Mission Management System (MMS) includes the theatre of operations, vehicle sub-systems and the MMS of other UCAV. An MMS architecture, organized around a database, including reactive and deliberative layers is described in detail. The deliberative layer includes a distributed mission planner developed using constraint programming and an agent framework. Experimental results demonstrate that the MMS is able, in a bounded time, to carry out missions, to activate the contingent behaviors, to decide whether to plan or not. 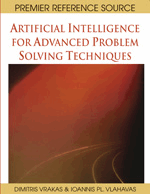 Some research directions remain open in this application domain of AI.